1	2	"Mitsubishi" Air Curtains, 1200mm. 2		"Tieman" Bump Pad and Curtain. 3		Hydraulic Scissor Dock Leveller, 3m x 2.4m. 4		"Toledo" Pallet Scale, 1500kg, Digital Readout. 5		"MTI" Swing See Through Doors, 2.5m x 1.8m. 7		Swing See Through Doors, 2m x 1.6m. 7A		Swing See Through Doors, 2m x 1.6m. 8	2	Freon FDC Units, 4 Fan. 9	2	Freon FDC Units, 3 Fan. 10		Stainless Steel Bin, 1200 x 1200 x 900mm. 11		Stainless Steel Bin, 1200 x 1200 x 900mm. 12		Stainless Steel Bin, 1200 x 1200 x 900mm. 13		Stainless Steel Bin, 1200 x 1200 x 900mm. 14		Stainless Steel Bin, 1200 x 1200 x 900mm. 15		Stainless Steel Bin, 1200 x 1200 x 900mm. 16		Stainless Steel Bin, 1200 x 1200 x 900mm. 17		Stainless Steel Bin, 1200 x 1200 x 900mm. 18		Stainless Steel Bin, 1200 x 1200 x 900mm. 19		Stainless Steel Bin, 1200 x 1200 x 900mm. 20	6	Stainless Steel Bins, 1200 x 1200 x 900mm. 21	9	Stainless Steel Bins, 1200 x 1200 x 900mm. 22		Stainless Steel Bin, 1800 x 1200 x 900mm. 23		Stainless Steel Bin, 1800 x 1200 x 900mm. 24		Stainless Steel Bin, 1800 x 1200 x 900mm. 25		Stainless Steel Bin, 1800 x 1200 x 900mm. 26		Stainless Steel Bin, 1800 x 1200 x 900mm. 27		Stainless Steel Bin, 1800 x 1200 x 900mm. 28		Stainless Steel Bin, 1800 x 1200 x 900mm. 29	3	Stainless Steel Bins, 1800 x 1200 x 900mm. 31		Stainless Steel Wash Basin. 35		Stainless Steel table, 1m x 900mm, Irregular. 36		Aluminium Work Platform, 2m x 750mm. 39		"Toledo" Bin Scale, 1500kg, Digital Readout. 43	2	"Conditionaire" Air Curtains, 900mm. 46		Mobile Pressure Foamer Cleaner. 47		Stainless Steel Tank, 2m x 1.5m on Stand. 51		Stainless Steel Tub, 3m x 900mm x 900mm. 52		"Bitzer" Twin Cylinder Freon Compressor/Condensor. 54		"Busch" Vacuum Pump and Receiver. 55		"Becker" Vacuum Pump and Receiver. 57		"Brine" Chiller, Pumps and Stainless Steel Tank. 58		"Brine" Chiller, Pumps and Stainless Steel Tank. 59		"Brine" Chiller - Twin Compressors. 61	2	"Davey" XJ70 Pumps. Screw Discharge with Stainless Steel Delivery Bin. Model 512 150 506 on Stainless Steel Mobile Stand. 65		Stainless Steel Table, 1200 x 1200. 66		Stainless Steel Table, 1200 x 1200. 67		Stainless Steel Netting Bazooka, Type. 68		"FPE" Pnuematic Stuffer, Model NSC-40-240. 68A		Stainless Steel Table, 2500 x 1000mm. 71	2	FDC Units, 2 Fan. 75	3	Stainless Steel Mobile Dump Bins, 600 x 600 x 600. 76	4	Stainless Steel Mobile Dump Bins, 600 x 600 x 600. 77	5	Stainless Steel Mobile Dump Bins, 600 x 600 x 600. 78	6	Stainless Steel Mobile Dump Bins, 600 x 600 x 600. 79	4	Stainless Steel Mobile Dump Bins, 600 x 600 x 600. 80	4	Stainless Steel Mobile Dump Bins, 600 x 600 x 600. 81	5	Stainless Steel Mobile Dump Bins, 600 x 600 x 600. 82	6	Stainless Steel Mobile Dump Bins, 600 x 600 x 600. 83	14	Stainless Steel Mobile Dump Bins, 600 x 600 x 600. 85	7	Stainless Steel Mobile Dump Bins, 600 x 600 x 600. 86		Stainless Steel Bin, 1200 x 1200 x 900mm. 87		Stainless Steel Bin, 1200 x 1200 x 900mm. 88		Stainless Steel Warwick Tub Stand. 89		Stainless Steel Warwick Tub Stand. 90		Stainless Steel Warwick Tub Stand. 91		Stainless Steel Warwick Tub Stand. 92		Stainless Steel Twin Warwick Tub Stand. 95		Stainless Steel Wall Mounted Rack, 4000 x 300mm. 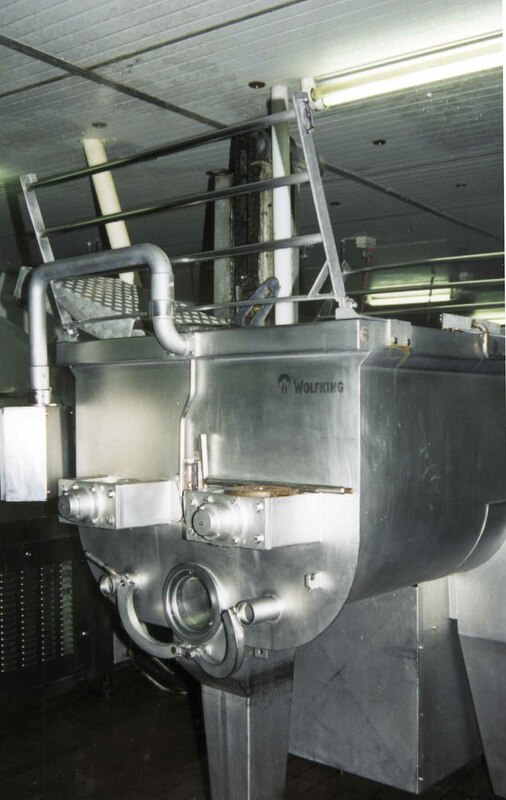 96		"Lutetia" Horizontal Vacuum Massager, 2000kg. 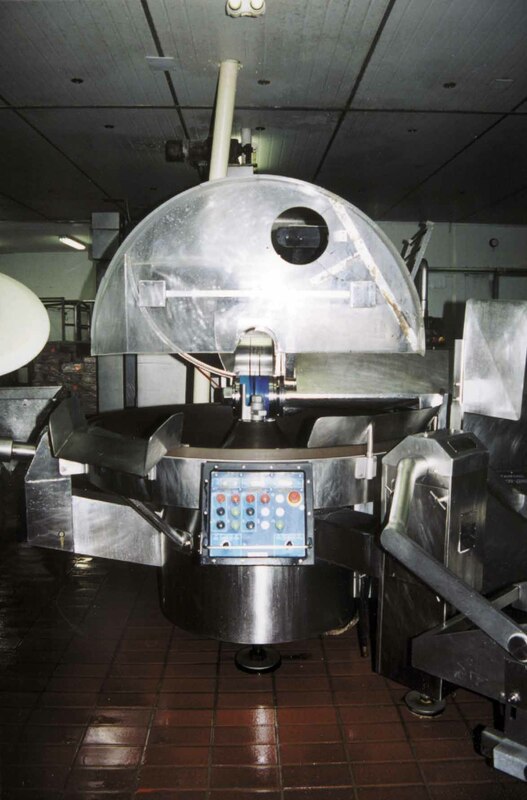 97		"Lutetia" Horizontal Vacuum Massager, 2000kg. 98		"Lutetia" Horizontal Vacuum Massager, 1500kg. 99		"Lutetia" Horizontal Vacuum Massager, 1500kg. 100		Stainless Steel Mobile Bin Lifter/Tipper. 101	2	FDC Units, each 6 Fan. 103		Poly Top Table, 2000 x 1000mm. Humidifying Ducts and Extraction Hood. 107		FDC Unit, 8 Fan. 108	6	Stainless Steel Mobile Smokehouse Frames. 109	6	Stainless Steel Mobile Smokehouse Frames. 109A	6	Stainless Steel Mobile Smokehouse Frames. 109B	8	Stainless Steel Mobile Smokehouse Frames. 110		"Flake" Icemaker, 500kg Day. 116	8	Stainless Steel Smokehouse Cages. 117	8	Stainless Steel Smokehouse Cages. 118	8	Stainless Steel Smokehouse Cages. 119	8	Stainless Steel Smokehouse Cages. 120	10	Stainless Steel Smokehouse Cages. 120A	9	Stainless Steel Mobile Smokehouse Cages. 120B	5	Stainless Steel Mobile Smokehouse Cages. 3000 x 1500 x 1000mm. 123		Stainless Steel Tub, 1600 x 1200 x 1000mm. 124		Stainless Steel Tank, 1400 x 1200 x 1200mm. 126		Stainless Steel Tub, 1500 x 1000 x 750mm. 127		Stainless Steel Tub, 700 x 700 x 700mm. 128		Mobile Draining table, 1200 x 1200mm. 135	12	Stainless Steel Mobile Smokehouse Cages. 136	4	Stainless Steel Mobile Smokehouse Cages. 137	4	Stainless Steel Mobile Smokehouse Cages. 138	12	Stainless Steel Mobile Smokehouse Cages. 139	35	Stainless Steel Mobile Smokehouse Cages. 139B	16	Stainless Steel Mobile Smokehouse Cages. 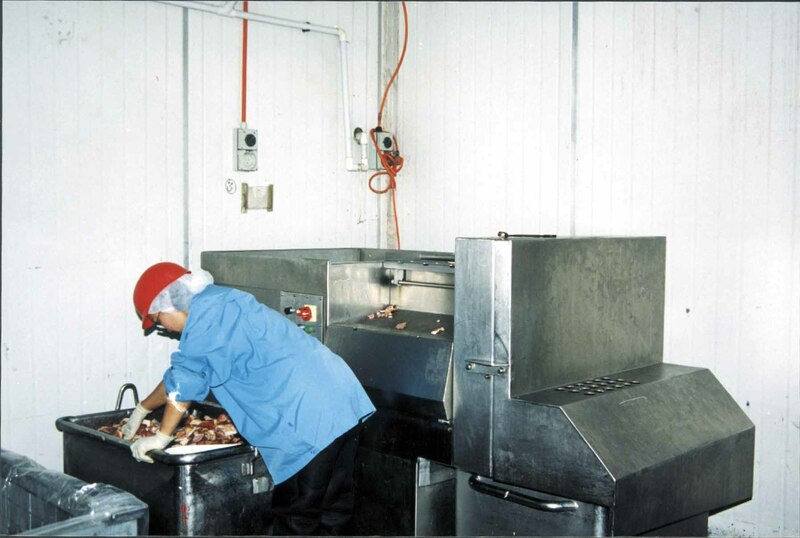 139C	14	Stainless Steel Mobile Smokehouse Cages. Model 502100-520 on Stainless Steel Mobile Stand. 147		"Vemag" Portable Linker, Model AVG-201. 148		"Polyclip" Clipper, Type FCA-3461. 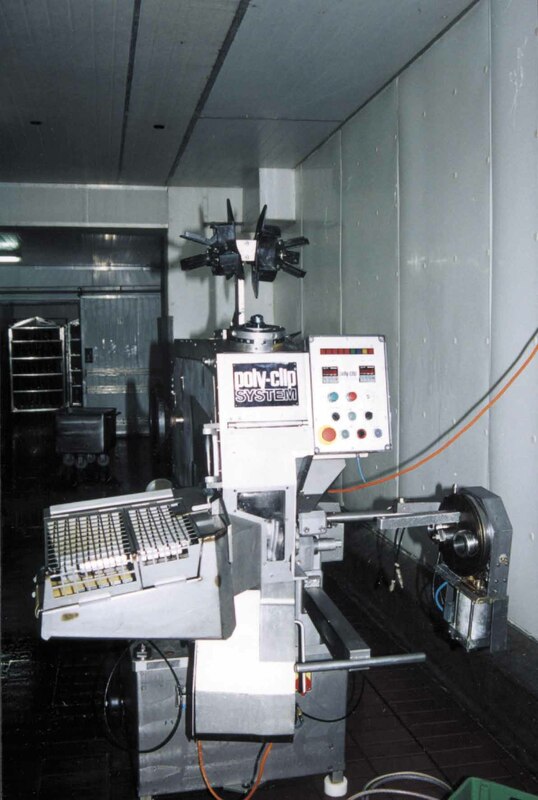 149		"Polyclip" Double Clipper, Type FGA-3461. 150		Stainless Steel Table, 3000 x 2000mm. 151		Stainless Steel Table, 2500 x 1500mm. 152		Stainless Steel Table, 2000 x 2000mm. Cutter, Model SM-325 with Bin Lifter. 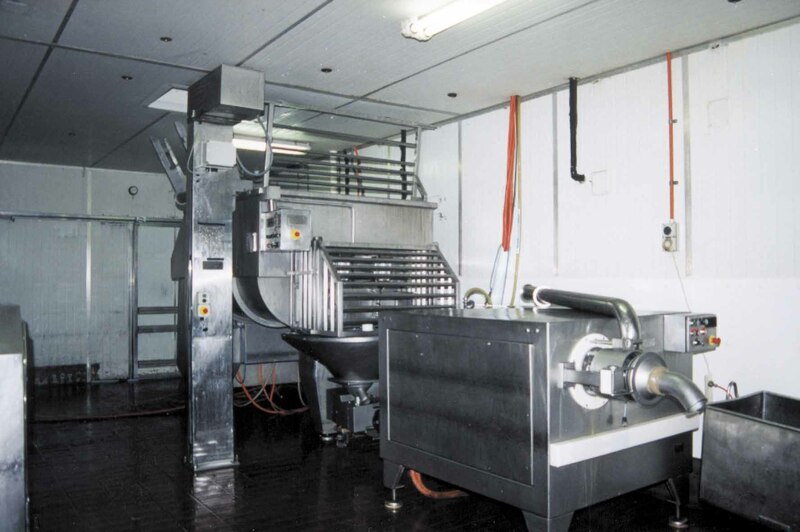 155		"Wolfking" Stainless Steel Mincer, Type C400-UNI. 156		"Wolfking" Stainless Steel Bin Lifter. 159		"Ishida" Bin Scale - Digital Readout. 161		"Jutland Engineering" Bin Lifter. 162A		Stainless Steel Mobile Table, 2000 x 750mm. 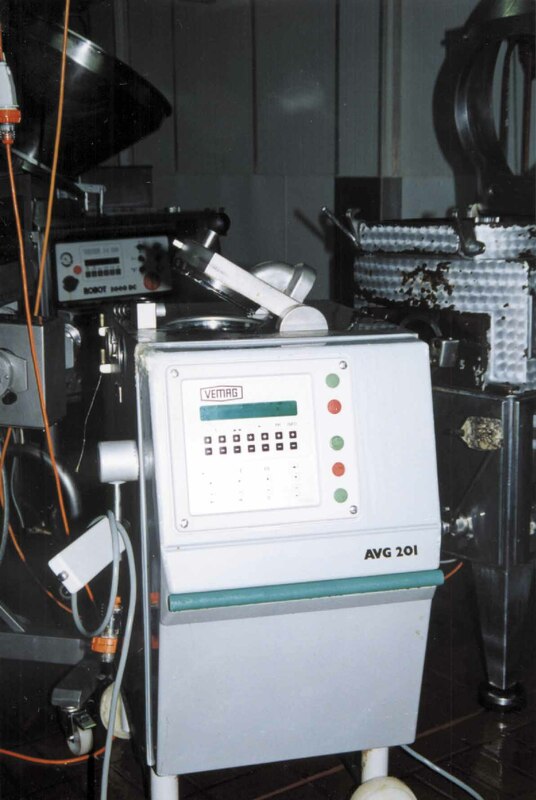 164		"Stephan" Microcut Emulsifier, Model MCHD60AUS1. 165		"Bettcher" Model 39 Power Cleaver. 166		"Belam" Pickle Injector, Type M!-601-9/141. 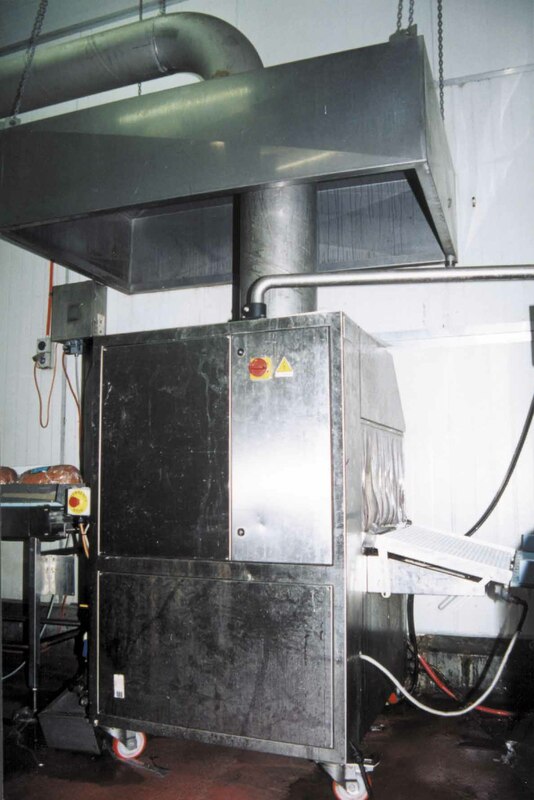 166A		"A.F.S" Frozen Meat Slicer. 170		"Polyclip" Clipper, Model DFC-8161. 171		"Thiele" Horizontal Jacketed Massager, 800kg. 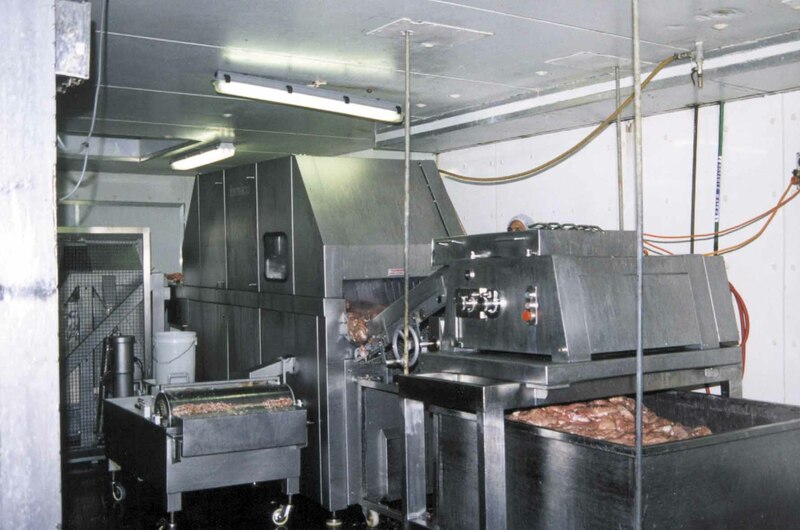 172		"Trief" Stainless Steel Dicer. with Stainless Steel Lifting Lugs. 180	18	White Poly Warwick Tubs. 181	12	Red Poly Warwick Tubs. 182	30	Green PVC Perforated Baskets. 183	28	Grey PVC Perforated Baskets. 184		Stainless Steel Tub, 1800 x 1200 x 900mm. 185		Stainless Steel Tub, 1800 x 1200 x 900mm. 186		Stainless Steel Tub, 1800 x 1200 x 900mm. 187		Stainless Steel Tub, 1800 x 1200 x 900mm. 193	2	FDC Units, 6 Fan and 3 Fan. 199	3	Stainless Steel Poly Bin Stands, 1200 x 1200mm. 200	3	Stainless Steel Poly Bin Stands, 1200 x 1200mm. 201	5	Stainless Steel Poly Bin Stands, 1200 x 1200mm. 231		FDC Unit, 5 Fan. 232		"Muller" FDC Unit, 4 Fan. 233		"Muller" FDC Unit, 4 Fan. 237	Qty	Galvanised Racking - 12 Bays. 238		Stainless Steel Topped Table, 1500 x 750mm. 240		Stainless Steel Table, 1m x 600mm. 241		Stainless Steel Table, 800 x 600mm. 242		Stainless Steel Shelf Unit, 2500 x 750mm, 7 Shelf. 243		See Through Strip Curtain. 244		"MTI" See Through Swing Door. 251		"Muller" FDC Unit, 2 Fan. 252		"Muller" FDC Unit, 2 Fan. 253		"Buffalo Trident" FDC Unit, 4 Fan. 254		"Buffalo Trident" FDC Unit, 4 Fan. 255	2	Mobile Stainless Steel Racks, 6 Shelf. 256	2	Mobile Stainless Steel Racks, 6 Shelf. 257	2	Mobile Stainless Steel Racks, 6 Shelf. 258	2	Mobile Stainless Steel Racks, 6 Shelf. 259	2	Mobile Stainless Steel Racks, 6 Shelf. 260	2	Mobile Stainless Steel Racks, 6 Shelf. 261	3	Mobile Stainless Steel Racks, 6 Shelf. 262	7	Mobile Stainless Steel Racks, 5 Shelf. 263	3	Mobile Stainless Steel Racks, 7 Shelf. 264	2	Mobile Stainless Steel Racks, 6 Shelf. 265	3	Mobile Stainless Steel Racks, 5 Shelf. 266		"Buffalo Trident" FDC Unit, 5 Fan. 267		"Buffalo Trident" FDC Unit, 5 Fan. 268		"Buffalo Trident" FDC Unit, 5 Fan. 269		"Buffalo Trident" FDC Unit, 5 Fan. 291	3	"Muller" FDC Units, 4 Fan. 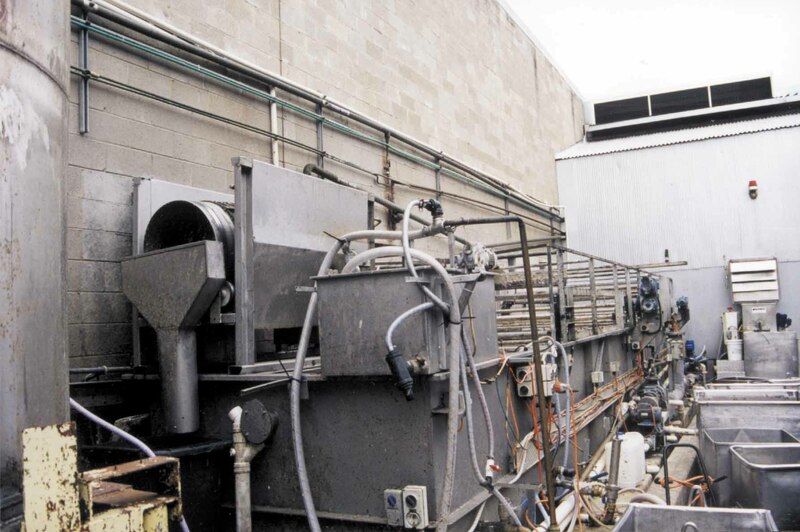 292		Poly Styrene Enclosed Bin Washer. 293		Bank Meat Rail, 6 x 7m. 294		See Through Swing Door. 295	2	"Muller" FDC Units, 4 Fan. 296		Hygenic Stainless Steel Bandsaw, 400mm Throat. 297	2	"Muller" FDC Units, 4 Fan. 298	2	"Conditionair" Air Curtains, 900mm. 321	4	"Muller" FDC Units, 4 Fan. 323		"Weber" Automatic Bacon Slicer, Model S900. 325		"Ishida" Digital Platform, Scale 30kg. 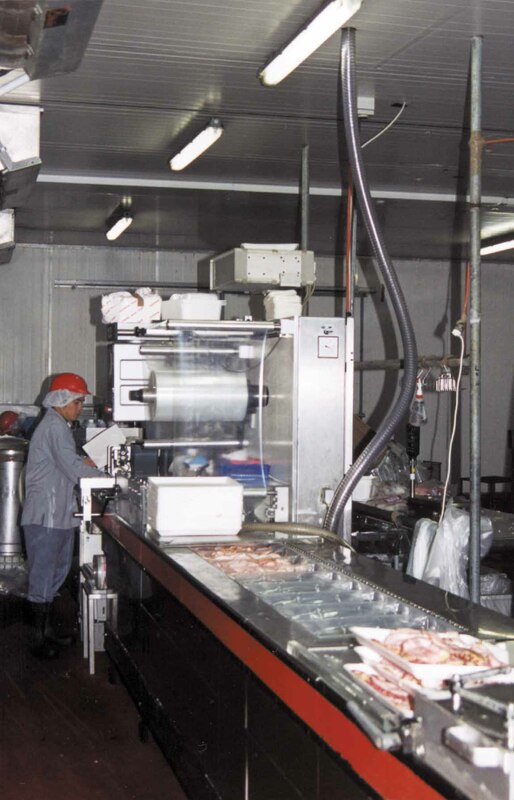 327		Stainless Steel Frame Belt Conveyor, 3000 x 400mm. 329		"Ishida" Digital Platofrm Scale, 15kg. 330		"Ishida" Digital Platofrm Scale, 15kg. 331		"Hycom" Digital Platofrm Scale, 15kg. 332		"Hycom" Digital Platofrm Scale, 15kg. 333		Stainless Steel Scale Table, 750 x 750mm. 334		Stainless Steel Scale Table, 750 x 750mm. 335		Stainless Steel Scale Table, 750 x 750mm. 336		Stainless Steel Scale Table, 750 x 750mm. 337		Stainless Steel Topped Table, 2500 x 750mm. 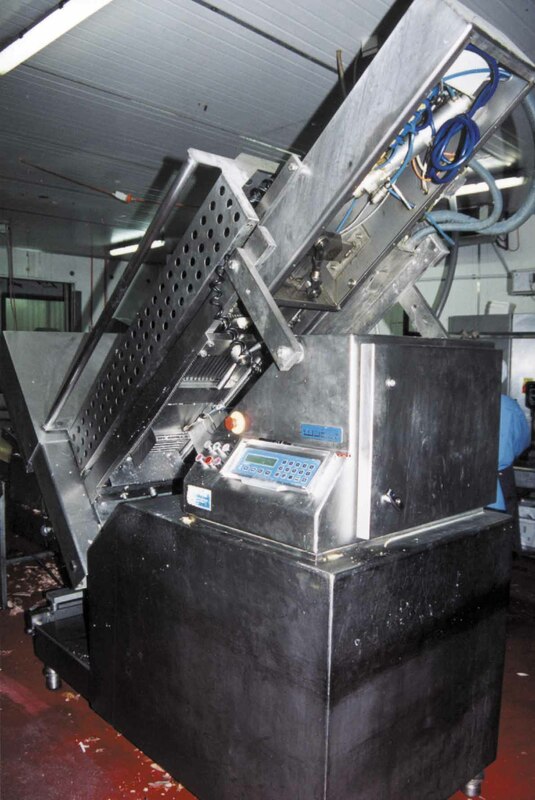 338		"Brice" Stainless Steel Benchtop Slicer. 339		Stainless Steel Table, 900 x 600mm. 340		Stainless Steel Table, 900 x 600mm. 341	2	Stainless Steel Topped Tables, 800 x 500mm. 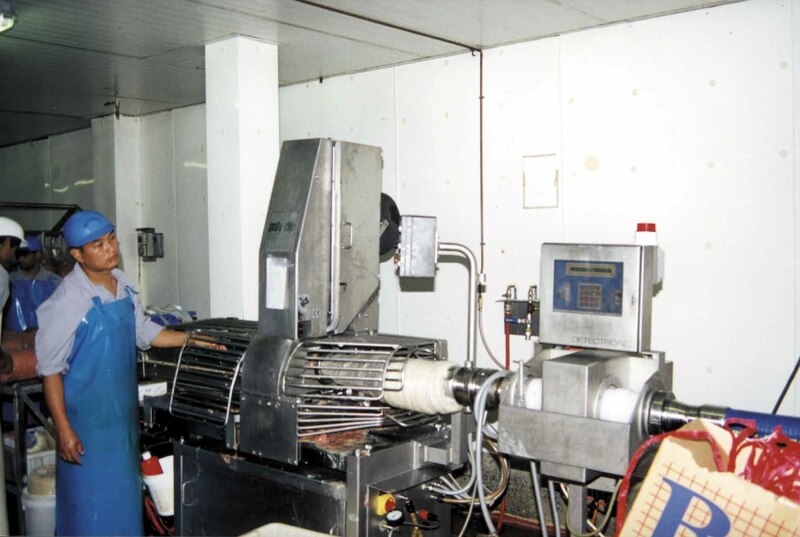 342		"Treif" Unimat Stainless Steel Dicer. 343		Thermal Tray Former Packager - Single Tray. 344		Stainless Steel Table, 1200 x 600mm. 345A		See Through Strip Curtain. 345B		See Through Strip Curtain. 346		Stainless Steel Table, 2000 x 1000mm. 347		Stainless Steel Table, 1000 x 400mm. 348		Stainless Steel Topped Table, 3000 x 1000mm. 349		Stainless Steel Topped Table, 3000 x 1000mm. 350		"Ishida" Digital Platform Scale, 30kg. Model 8630T-18 with 2 "Busch" Vacuum Pumps. 355		Poly Topped Drawing Table, 2000 x 1200mm. 356	2	"Muller" FDC Units, 4 Fan. 357	2	"Muller" FDC Units, 4 Fan. 359		"Coldrite" Twin Cylinder Compressor/Condensor. 363	2	Stainless Steel Wash Basins. 364		"Ranger Apollo" Sausage Peeler. 365		"Pulford" 4 Cylinder Air Compressor, 7.5kw. 366		"Pulford" 4 Cylinder Air Compressor, 7.5kw. 367		"Pulford" 4 Cylinder Air Compressor, 7.5kw. 368		"Terry" 4 Cylinder Freon Compressor. 369		"Terry" 4 Cylinder Freon Compressor. 370	2	"Kelvinator" 2 Cylinder Freon Compressors. 371		Vertical Air Receiver, 1200 x 800mm. 372		Vertical Air Receiver, 3000 x 1000mm. 373	2	"Terry" 2 Cylinder Freon Compressor/Condensor. 374		"Terry" Twin Cylinder Freon Compressor/Condensor. 375	3	Twin Cylinder Freon Compressors/Condensors. 376	2	Stainless Steel Tubs, 2000 x 800 x 800mm. 377	2	"Grundfos" CR8 Multi Stage Pumps. 378	3	"Grundfos" CR4 Multi Stage Pumps. 382		Stainless Steel Shelf Unit, 3000 x 2000mm. 384		Clothes Locker, 2 Chairs, Urn. 387	3	Stainless Steel Wash Basins with Foot Pedal. 388		"Simplex" Time Clock and 9 Racks. 389		Canteen Tables and 8 Chairs. 400	22	Half Door Clothes Lockers (Brown). 402	2	Laminated Canteen Tabls, 2000 x 750mm. 403	2	Laminated Canteen Tabls, 2000 x 750mm. 404	2	Laminated Canteen Tabls, 2000 x 750mm. 405	2	Laminated Canteen Tabls, 2000 x 750mm. 406	5	Laminated Canteen Tabls, 2000 x 750mm. 407A		"National" Wall Mounted Air Conditioner. 408		"Sharp" Carousel Microwave Oven. 411		Stainless Steel Table, 1500 x 800mm. 412		"Comfrig" 2 Door Refrigerator. 412A		Whiteboard, 1500 x 1500mm. 415		Laminated Desk and Bookcase. 416		Swive Chair on Castors. 417		Laminated Desk, 2000 x 800mm. 418		Metal Framed Desk, 1500 x 800mm. 421		Steel Filing Cabinet, 2 Drawer. 423		"Kelvinator" Wall Mounted Air Conditioner. 424		Laminated Bookcase, 2000 x 1000mm. 425		Whiteboard, 1000 x 1000mm. 426		Steel Staionery Cabinet and Clothes Locker. 427		Swivel Chair on Castors. 429	6	Bays Steel Shelving, 1500 x 1000mm. 430		Laminated Desk, 2000 x 1000mm. 431		Timber Desk, 2000 x 800mm. 432		Black Timber Desk, 2000 x 1000mm. 434		Swivel Chair on Castors. 435		Swivel Chair on Castors. 436		Swivel Chair on Castors. 438		"National" Wall Mounted Air Conditioner. 441		Whiteboard, 1500 x 1500mm. 444		Steel Filing Cabinet, 4 Drawer. 447		"Sharp" Compet CS-1635 Calculator. 448		"Canon" P-120 DH Calculator. 450	11	Bays Steel Shelving. 451		"And" Benchtop Scale, 15kg. 452		Bay Pallet racking, Pipe Rack, Pipe Bench. 454	32	Quarter Door Clothes Lockers. 455	5	Bays Steel Pallet Racking. 456	32	Bays Steel Shelving. 459		"Muller" Twin Fan Condensor. 460		"Muller" Twin Fan Condensor. 462		"Muller" 3 Fan Condenser. 463		"Buffalo Trident" 3 Fan Condenser. 464		"Buffalo Trident" 3 Fan Condenser. "Muller" Condenser ( Room 6). 2 Condensers ( Room 14 ). 471		"Muller" 3 Fan Condenser. 472	4	Condensers, 2 Fan. 473		"Buffalo Trident" 3 Fan Condenser. 480		1996 "Volkswagon" Insulated Van, Reg No: QPW 424. 482		"Crown" Electric Pallet Transporter, Model 20M. 483		"Tieman" Bump Pad and Screw. 484		1990 "Ford" Fairlaine Sedan, Reg No: SHZ 153. 485		1991 "Mitsubishi" Magna Sedan, Reg No: SWX 215. 486		1986 "Holden" Commodore Sedan, Reg No: OQL-817. 487		1984 "Mercedes Benz" 280 SE, Reg No: NNZ 433. 493	3	Poly Tanks and Stainless Steel Tank. 494	2	Freon FDC Units, 6 Fan. 497	2	FDC Units, 4 Fan - Thrawing Room. 498	2	"Muller" FDC Units, 4 Fan. 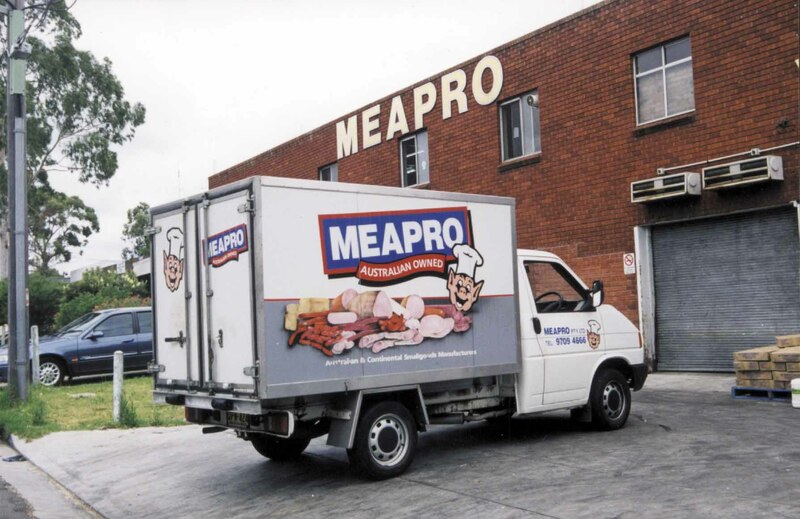 502		Poly Styrene Freezer, 15m x 7m with Door. 503		Steel Pallet Racking, 42 Pallet Capacity. 504	3	Freezer FDC Units, 2 Fan. 505		Steel Workbench, 1200 x 900mm and Vyce. 506A		"Ideal" 120N Mig Welder. 508		"Acta" Electric Drop Saw. 509		"Acta" Electric Drop Saw. 510		"Kelvinator" Wall Mounted Air Conidtioner. 512		"Bailey's" Aluminium Stepladder, 3m. 513		Steel Cupboard and Spares - "Fomaco". 514		Steel Cupboard and Dynabolts, Pop Rivets. 515		Steel Cupboard and Grinder Wheels, Spray Cans. 516		Steel Cupboard and Paint. 517	3	Steel Lockers and Contents - Gauges. 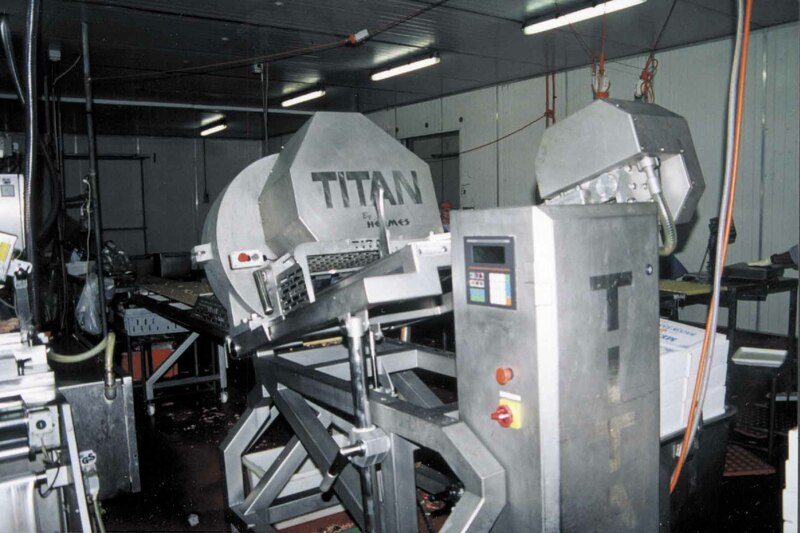 518		Contents of 2 Bays "Titan" Slicer, etc. 519		Contents of 1 Bays "Wolfking" Microcutter Spares. 521		Contents of 2 Bays Assorted Chain. 522		Contents of 1 Bay "Frankomatic" Spares. 523		Contents of 2 Bays Bearings. 524	2	Whitebelts - Unused. 525		Contents of 6 Bays - Electrical Spares. 526		Contents of 1 Bay - Boiler Spares. 527		Contents of 1 Bay - Smokehouse Spares. 528		Contents of 1 Bay - Cutter Spares. 529		Contents of 1 Bay - Filler Spares. 530		Contents of 1 Bay - Clipper Spares. 531		Set of Blades for "Treif" Dicer. 532		Contents of 1 Bay - "Webber" Slicer Spares. 533		Contents of 2 Bays - "Tiromat" Spares. 536		Oxy Trolley Hoses and Gauges. 537		"Transplasma" AP30 Plasma Cutter. 542		"Dawn" 150 Offset Vyce. 543	5	Parts Draw Cabinet and Contents. 545		Workbench, 12m with Vyce. 546		Workbench, 6m with Vyce. 547		Poly Parts Bin and Contents - Brass Fittings. 548		"Jet Chisel" Pneumatic Scabbler. 550		Pipe Cutter, Expander, Bender. 552		"Hafco" 10 Ton Hydraulic Press. 553		"John Heine" Manual Folder. 555	3	Pallets Electric Motors. 556		Contents of Rack Plumbing Spares, etc. 557	2	Bays Heavy Duty Pallet Racking. 558	Qty	Oils and Grease. 560		Floodlights, Exhaust Fan, Slicers, etc. 562	Qty	Poly Wheels and Frames. 566		"Westinghouse" 2 Door Refrigerator. 567		Air COnditioner, Urn, Table and Chairs. 568	Qty	Flexiable Plastic Hose and PVC Conduit. 570		"Copeland" Sealed Unit (Thaw Room). 571	Qty	Assorted "V" Belts. 572		"Swan" Twin Cylinder Air Compressor. 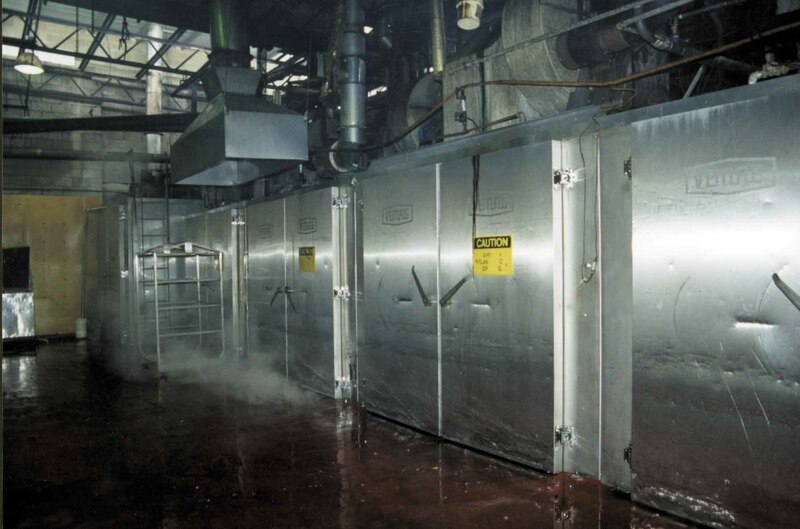 573		"Copeland" Sealed Unit (Chilling Tanks). 576		"Terry" Four Cylinder Freon Compressor.